Somali pirates have released an oil tanker and its crew of 23 sailors from South Korea and the Philippines after holding them hostage for three months. Somali pirates have released an oil tanker and its crew of 23 sailors from South Korea and the Philippines after holding them hostage for three months, South Korea's foreign ministry said on Saturday. 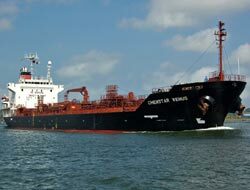 The Chemstar Venus, a Japanese-operated combined chemical and oil tanker, was hijacked off the coast of Somalia in mid-November. It had a crew of 18 Filipinos and five South Koreans. "The sailors are all safe and the South Korean crew will return home," the ministry said in a statement. There was no mention of whether a ransom was paid for the release of the sailors and the 20,000 deadweight tonne vessel. Last year, gunmen from the anarchic Horn of Africa nation hijacked dozens of ships and won tens of millions of dollars in ransom payments. The South Korean government would send a navy vessel soon to the Gulf of Aden to protect the country's commercial vessels from pirates, the statement added. Other nations have sent naval ships to the region to combat the threat of pirates.